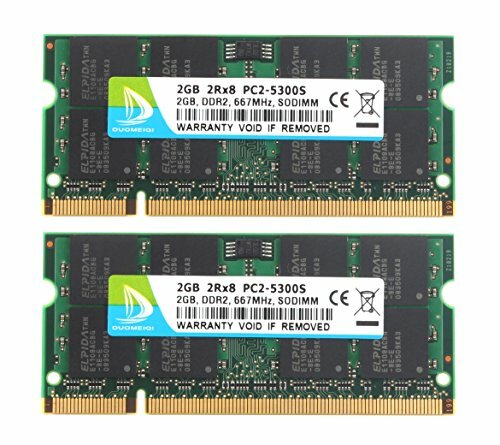 Type: PC2-5300S 200Pin SODIMM Laptop memory. Advanced Quality: DUOMEIQI memory chips are from big brand manufacturers such as Samsung, Hynix, Micron, Elpida, Kingston, Nanya, Qimonda. Advanced electroplating process is applied on the connecting finger, greatly improve corrosion resistance and electrical conductivity. Hand-checked and tested for quality at each step in the manufacturing process, a high level of reliability. Superior Performance: Empowers your computer to achieve faster loading times, system responsiveness; handling data-intensive programs and multitask easily and quickly. Which will also reduce power consumption and extend battery life. High Compatibility: 100% compatible with Intel, AMD and Mac system. Unbuffered, Non-ECC. Easy Installation: No computer skills needed. Open the RAM cover, take down the original memory, install DUOMEIQI RAM, close the cover. My friend very easy, right? Please note to turn off computer before installation. Guaranteed: Lifetime warranty, free technical support. For any problem, please feel free to reach us at dmq_store@163.com, we are here for you 24 hours.